In the minds of many, the provision of justice and security has long been linked to the state. To ask whether non-state institutions could deliver those services on their own, without the aid of coercive taxation and a monopoly franchise, runs the risk of being branded as naive anarchism or dangerous radicalism. Defenders of the state’s monopoly on lawmaking and law enforcement typically assume that any alternative arrangement would favor the rich at the expense of the poor—or would lead to the collapse of social order and ignite a war. 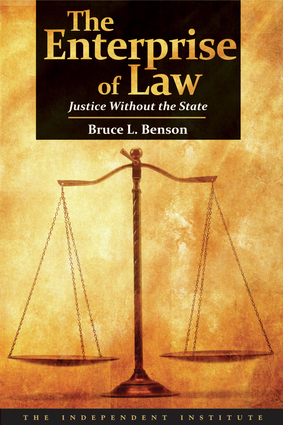 Questioning how well these beliefs hold up to scrutiny, this book offers a powerful rebuttal of the received view of the relationship between law and government. The book argues not only that the state is unnecessary for the establishment and enforcement of law, but also that non-state institutions would fight crime, resolve disputes, and render justice more effectively than the state, based on their stronger incentives. Bruce L. Benson is the recipient of the Ludwig von Mises Prize and the Adam Smith Award, a senior fellow of the Independent Institute, and a contributing editor of the Independent Review. He is a professor of economics at Florida State University, has written numerous articles and reviews, and is the author of The Economic Anatomy of Drug War, Privatization in Criminal Justice, and To Serve and Protect. He lives in Tallahassee, Florida.